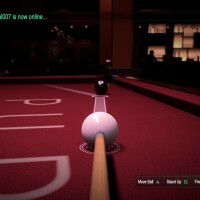 Pure Pool is the first realistic pool simulator for the PS4, developed by indie developer VooFoo Studios and published by Ripstone. 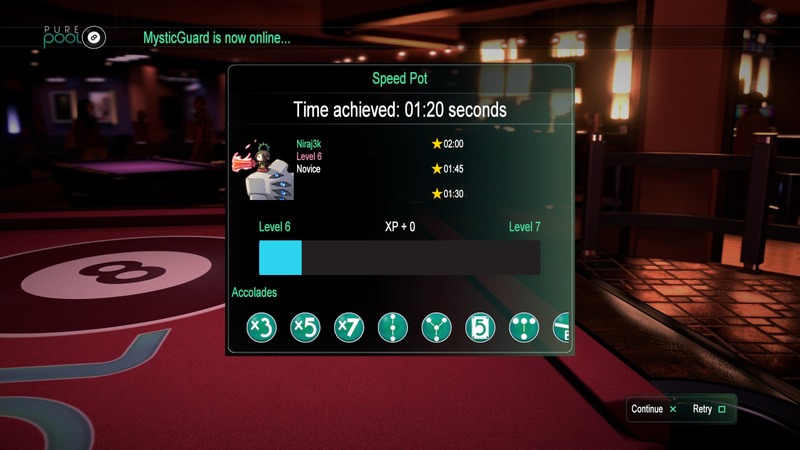 The studio also developed Hustle Kings on the PS3, and used their skills to build Pure Pool from the ground up. It has to be said that this game looks amazing, with its beautiful high definition graphics and silky-smooth gameplay. 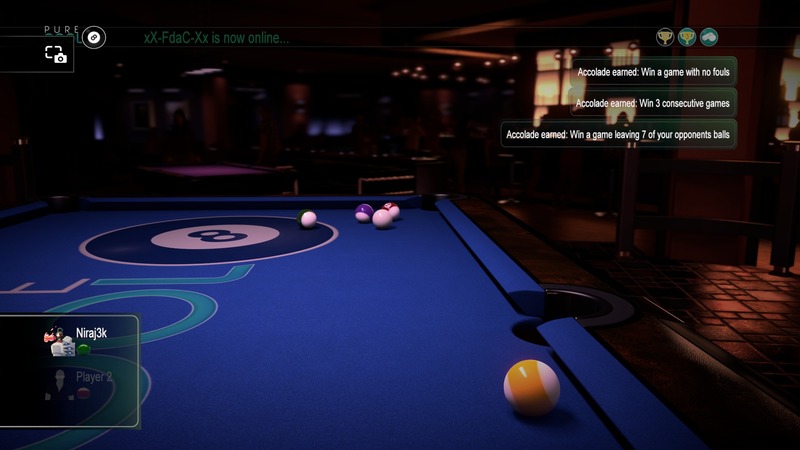 The game as four single-player modes, ranging from classic American 8 Ball to Killer, and four challenges from Royal Rumble to Perfect Potter. It also has a multiplayer mode where players can play others in one-on-one challenges, or join global and custom leagues. The whole game is a connected experience so you’ll constantly get notifications on when players are online – not just friends, but all players. 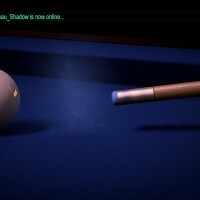 The first thing you’ll do is play the Tutorial mode, learning the controls of the game and trying to pot all the balls. 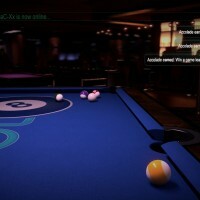 Completing the tutorial will only take a few minutes, and you’ll be rewarded with your first few trophies (“Cue’d Up” for completing the tutorial, and “Can I Have My Ball Back?” for knocking the ball of the table). I started off with Career mode next, playing various AI opponents and challenges to earn XP and level up. The main issue I found with this mode is that the AI is very slow in making decisions. In fact, the AI has completely frozen on a few occasions, failing to make a decision – frustrating when you’re winning the frame. Sometimes the AI can take up to 30 seconds to make a decision, when I’ve seen similar games make near-instant decisions. Maybe it’s done on purpose to give the game a realistic feel, but when you’re trying to complete a challenge like beating your opponent in 150 seconds, it can become frustrating. There isn’t even an option to skip the AI shot, so you have no choice but to watch them play until its your turn again. The game makes use of accolades, which are like in-game badges that are awarded to the player when they complete a specific requirement, and there are also trophies. If you’re a trophy hunter, you’ll be happy to know that the game features a Platinum trophy, but will be quite challenging to unlock. Earning certain accolades, and even numerous accolades of the same kind are linked to trophies, so it’s worth trying to unlock these as you play. The controls are pretty simple, but it’s difficult to make precise shots at times. 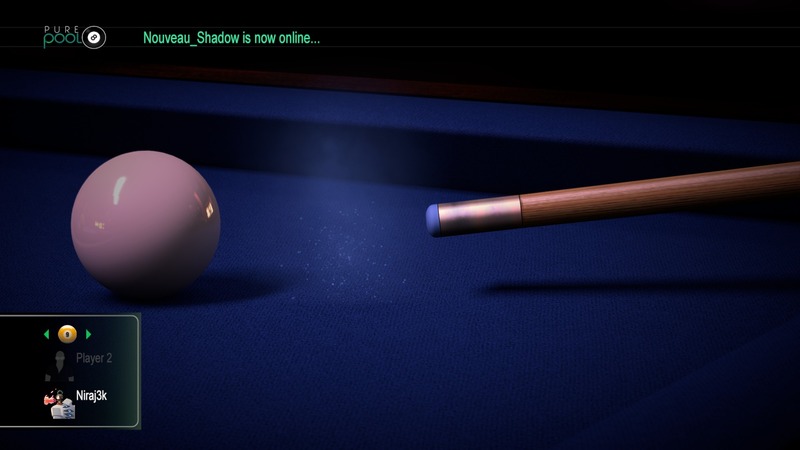 You can use the left-analogue stuck to aim the cue ball, and the right-analogue stick to shoot, pulling it back and then forward. The quicker you move the right-stick, the more powerful your shot will be. There isn’t a button to view the entire table from above, which is quite annoying, but you can hold down square to move around the table to get a better view at the table. However, your aim on the ball will be lost of you do so, meaning you have to reposition. You can use the touch pad to look around the area while aiming, but the best way to look around is to use square. Circle can be used to apply spin to the ball, helping with those trick shots and to apply back-spin to the ball. 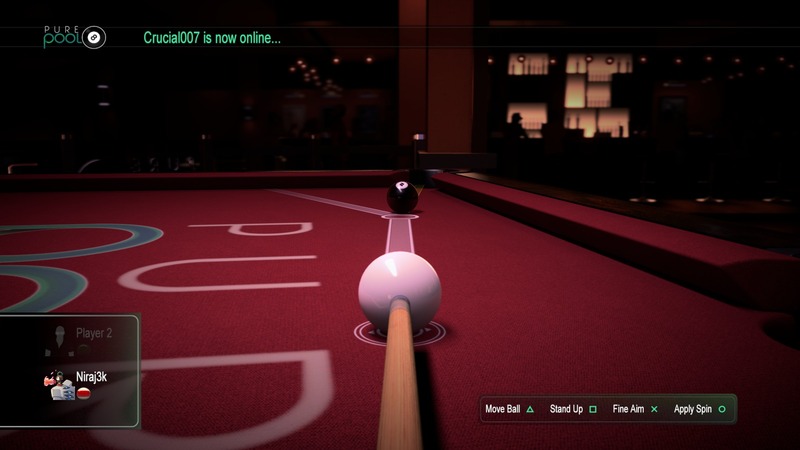 When aiming, a yellow bar will indicate when the ball you’re aiming for is going, while a white bar will show you where the cue ball will go after. These both help you to aim for pockets and line-up your next shot. If you’re trying to hit a ball from far away, the yellow and white bars will fade away, making it harder to aim. Similarly, going for shots from tight angles will mean the width of the yellow bar will widen, making it harder for you to determine where the ball will go. Aside from the fact that there is no over-head camera view, another thing lacking is the option of having a instant replay. Sometimes you’ve made a wonderful shot and want to see it again, but unfortunately you can’t. If you don’t like the controls, you’re out of luck too. There’s only one control scheme, and you only have the option to invert the X and Y axis. The game looks amazing, with realistic and fluid ball movement and dynamics. In fact, its some of the best looking balls I’ve seen (innuendo aside). The environments you play in have dynamic back drops, so it feels like you’re playing in an actual bar or club. The characters in the background are blurry, but make it feel like you’re in a real environment. When taking the final shot to pot the 8 ball or 9 ball, there is a nice slow-motion close-up of your shot, giving away the fact that you’ve made the pocket. If you had a near miss, you just get a slowed-down blurry version of the miss. Either way, you can instantly tell whether you managed to get the final ball into the pocket before it happens. It’s a nice touch, but a replay feature would have been good too. It would have been nice to see your AI opponent move around the table as they play, or while you’re taking a shot. Instead, your point of view is always from behind the cue ball – whether its your turn or not. There is constant background music as your play, which reminds of taking a ride in an elevator. Unfortunately, the music cannot be changes but you can turn it down or mute it if it annoys you. Apart from this, the only other sounds in the game are the sound affects of the balls and table, and some subtle background chatter from the environment. 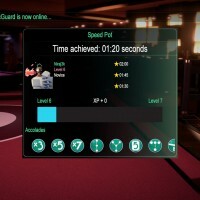 The game features one-on-one multiplayer, which can be played with anyone that’s online, or event a friend that’s offline but using their play style. The game refers to this as Player DNA in the game, which collects information about how a player plays the game, and then uses this to create an AI version of a real player. It means if your friend isn’t online, you can still play against an AI version of them. The game also includes local 2-player mode, letting you play with a friend or family member using a single controller or two controller. In order to activate this mode, you just need to choose “Player 2” from the player list. Unfortunately, you cannot customise the name or avatar for the second player, so your friend will always be called “Player 2”. This would be an even better game if the AI wasn’t so slow, or if the was a skip button to go straight to your next shot. The lack of an overhead camera to see the whole table is also a huge oversight by the developers, and one that would make the game that must better. Still, for a game that’s only £7.99 / €9.99, you can’t really go wrong.